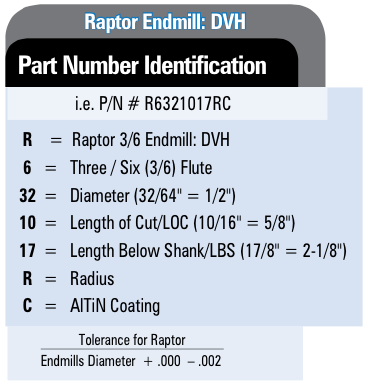 Raptor 3/6 DVH - This group of tools evolved from our Raptor DVH end mills designed for high temperature alloy machining in materials such as Stainless Steel & Titanium. We designed this for getting superior finishes in those materials. 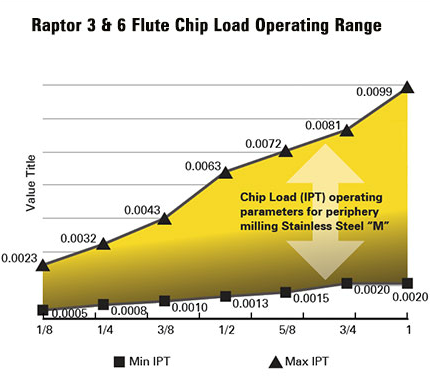 The Raptor 3/6 is designed for Periphery Milling NOT slotting applications. Program the Raptor 3/6 as if it were a 6 fluted tool. ​The Chip Load per Tooth (IPT) values shown here are based upon 6 flute NOT 3 flute values. 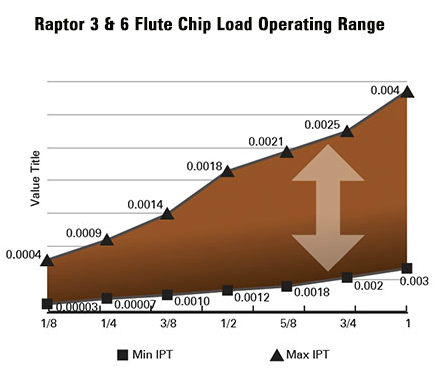 Because the Raptor 3/6 has a “trailing edge” the Chip Load is spread between the leading edge which actually takes more of the chip load than the trailing edge in the cut. Additionally, because of the double variable helix design, the actual chip load per tooth will vary along the Axial Length of Cut. 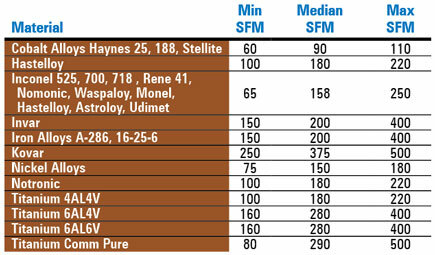 Without complicating your calculations this Operating Range chart is a simple and easy-to-use reference to begin maximiza- tion of your metal removal rate.